- Built-in MiniBeacon firmware based on chipset CC2541 made in Texas, US. - Built-in pairing password to prevent others from modifying the settings. - UUID,Major,Minor,Name values can be modified. - Covered range: 30-100 meters in the open space. - Replaceable Li-ion coin battery 280mah. -Open device & replace battery: Rip off the big green circle as showed in photo and then you'll see the screws. Open it with a screwdriver. 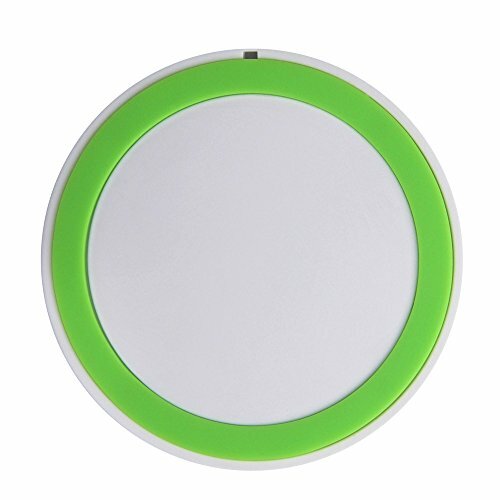 -Turn on/off device: Press the center of the big green circle for over 2 seconds to turn on/off the ibeacon. -Factory reset: Press the center of the big green circle for over 10 seconds. - There is no USB unit although there's a USB socket. Because this model also has a battery rechargeable version. For production reasons, the socket is still there. But battery is sure replaceable. Please follow the photo and operations to replace battery. - There is no instruction with the iBeacon, because this ibeacon is compatable with most apps. And apps change/update every now and then. The example of app LightBlue is recommended in Apple Sore. For android, currently there's a problem with our app. - Most common reason fail to reset the values is because of forgetting to exit the beacon. After rewriting the new values,(no need to turn it off)please exit the beacon to make it work. After detecting the beacon again and we'll see the vlues changed. Try one more time if you are changing the beacon name. The photos and description are updated. Sincerely sorry for all the trouble. Please feel free to contact us for any problem, We'd be glad to help. Thank you! A beacon is a small wireless device that constantly broadcasts radio signals to nearby smartphones and tablets.Think of it as a lighthouse emitting light in regular intervals.Mobile apps can listen for that signal,and when they receive it,trigger a location-based action. Built-in MiniBeacon firmware and easy to replace the battery. Built-in pairing password to prevent others from modifying the settings. UUID,Major,Minor, transmit power values can be customized. It's not support for Eddystone.